Coming to the end of winter in March 2016 – Tianjin Stray Animal Rescue Centre aka Common Home For All will be moving to their new location once renovation is completed. “Madam Yang : You’re a diamond… they cannot break you”. The new place will be a positive influence to move forward with your head held high. SADLY, AFTER MRS YANG HAD FINALLY INSTALLED HER RESCUES IN THEIR NEW HOME, TORRENTIAL RAIN AND FLOODING HIT TIANJIN CAUSING SEVERE DAMAGE TO THE SHELTER. This was a devastating setback for Friends Of Yang as they had established an excellent working relationship with a local vet and had allocated any funds raised to pay for veterinary care, neutering and medicines. The small group, on instructions from Mrs Yang, don’t send money to Mrs Yang but instead they pay vets and suppliers directly. The precious medical contingency fund retained, after Mrs Yang’s veterinary store had been stocked, has had to be redirected to buy building materials and to pay the builders. NOW THE RACE IS ON TO FUND REPAIRS TO THE SHELTER BEFORE WINTER. We have been made aware of a Formal Notice issued by the World Protection for Dogs and Cats in the Meat Trade that appeared on their Facebook page on September 4th. 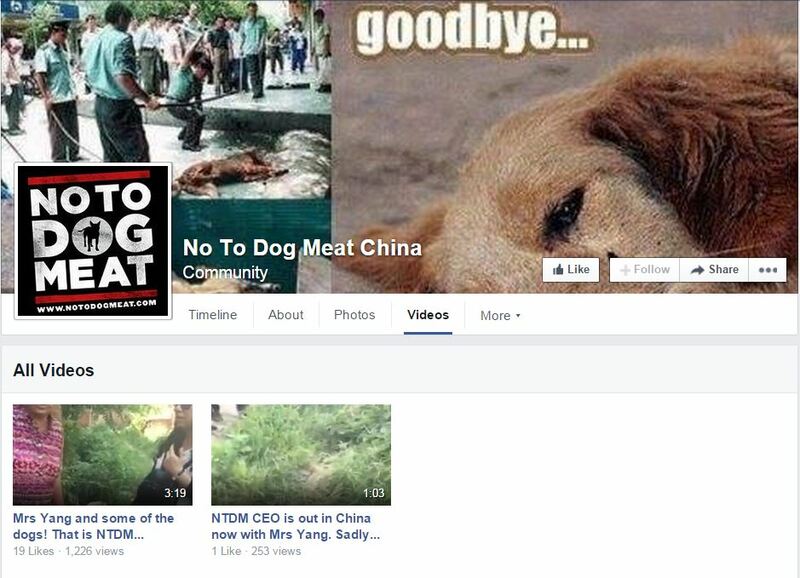 No To Dog Meat is the official campaigning body for the abovementioned Charity and has many Facebook pages as well as its own website. With the varying statements issued this past week it is slightly confusing to know which ones are actually official, or simply rewritten by the various page admins. To keep things simple we have chosen to focus on the “Formal Notice” issued on the World Protection for Dogs and Cats in the Meat Trade as this, after all, is the actual Charity itself. Below is a screen capture of the Formal Notice. It can also be viewed by clicking on the link at the beginning of this post. 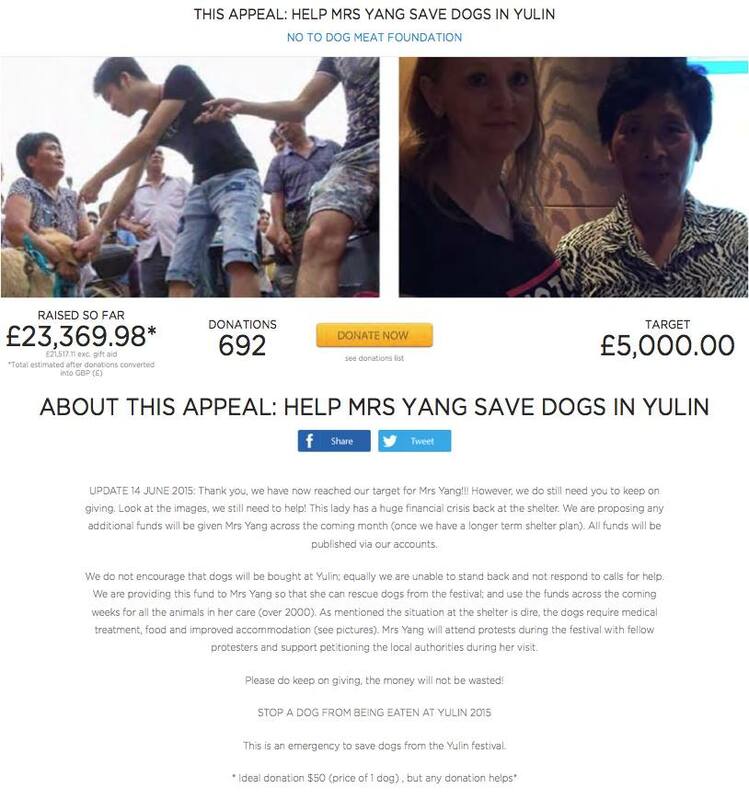 The fundraiser was actually set up to “Help Mrs Yang Save Dogs in Yulin” according to the fundraising page, so why do you refer to ‘the rescuer’, ‘this person’? What does this part of the statement actually mean? 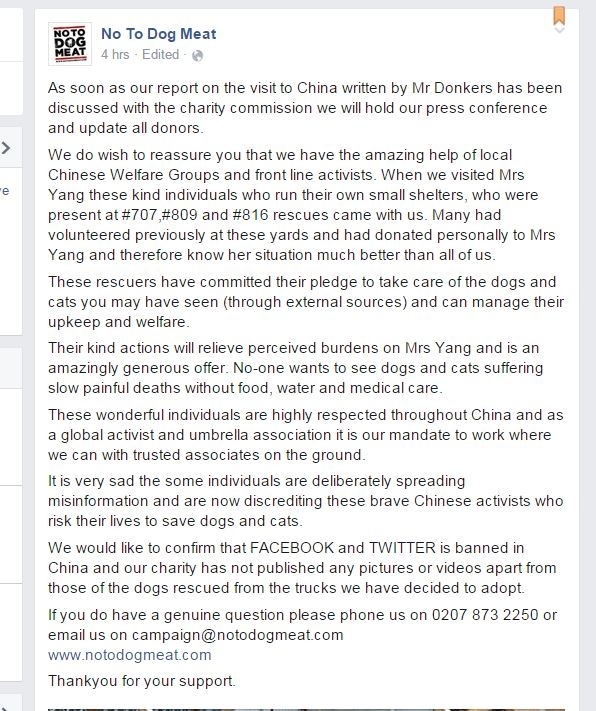 “The money raised purchased (we have been told by sources including a leading animal expert) that this money saved 500 dogs and 100 cats.” Why would you need a leading animal expert to tell you exactly how many dogs and cats were saved by Mrs Yang? Why wouldn’t you simply ask her yourself while you were there, or even before you left on your China trip? It is our understanding that Mrs Yang was already in Yulin saving dogs before any monies were available from the charity, so it is quite possible that she used her own funds at that time. Who are the ‘various known groups’ that went with you to visit all the shelters. Were they pictured in the video publicly shared showing Mrs Yang in some distress. How is it possible to identify over 500 dogs and 100 cats unless they are separated from all the other animals. Who is the ‘leading animal welfare organisation working on the ground’? 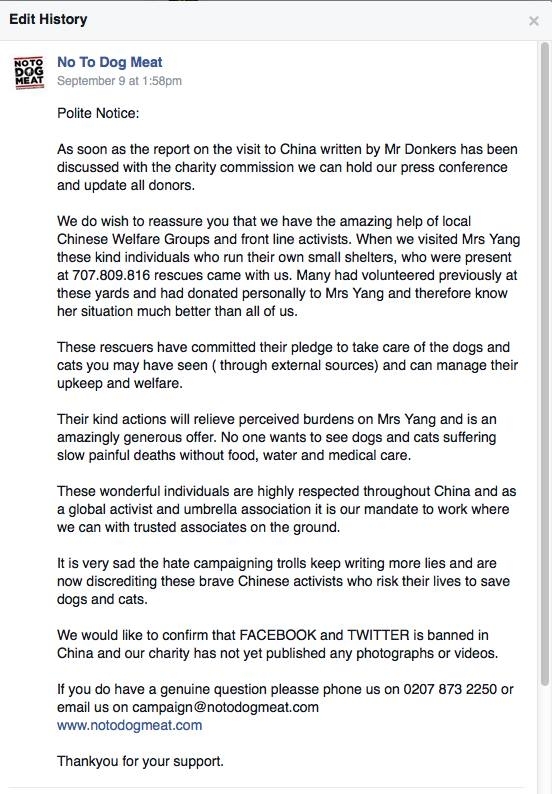 Is there a reason none of the ‘local shelters and activists’ have not stepped up to assist Mrs Yang previously? Has anyone actually asked Mrs Yang why she has not accepted local help considering her situation has been dire for a long time. Why do you need to rely on the newspapers for information on these dogs when your charity has often stated that you are in constant contact with Mrs Yang. You go on to call Mrs Yang ‘the person in question’. Do you think you should at least be polite enough to use her name, after all you certainly used it to raise all the funds you are currently sitting on. Facebook and Twitter may well be banned in China so how does your NTDM China page, run by Chinese volunteers actually function? We must say that we find it very disturbing that this Charity, despite using Mrs Yang’s name to raise funds for her, appear to have wiped her name out of any updates, why is that? Nobody is under any illusions as to the tragic situation she is currently in, yet the most recent posts from the Charity appear to be promoting an altogether different shelter with very little current news regarding Mrs Yang despite many people constantly asking for news only to be told ‘there is a report coming’. We would have to ask then, while this report is coming have any more funds been given to Mrs Yang to help her provide more food, medicines etc? While it is admirable for local shelters to offer to assist Mrs Yang, or as you call her ‘this person’, it is interesting to note that this has only recently appeared to be the case. If it is because prior to this fundraiser Mrs Yang may either not have been offered help, or if so had declined for reasons only known to her, what has now changed for all these people to suddenly not only be offering help but that it is being accepted? While all of these posts are somewhat similar, we do not feel we need to comment in-depth on each individual post, but have made several notes. The screen captures follow. 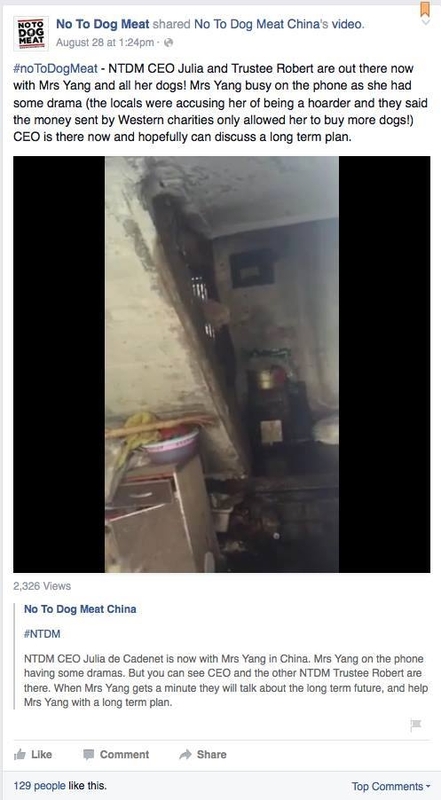 As we are well aware, the social media pages of this charity are unable to comment officially but we felt we should also share the two posts by the Facebook page of No to Dog Meat. It seems that their original post was edited for reasons only known to them. This post was the first one that appeared on the NTDM Facebook page. The “Polite Note”. This contains a reference to trolls and hate campaigners, lies about Chinese activists, and that NO photo’s or videos were ever published by the Charity as Facebook and Twitter are banned in China. Later this statement was replaced by an edited version as can also be seen below. While this one removes the references to ‘trolls and hate campaigns’, it now introduces an addition of photos showing dogs rescued from the trucks that the charity has decided to adopt. As to the idea that no videos are posted by the charity. One would have to ask why the NTDM China page still has 2 of 3 videos still on their page. Do your social media admins not read your official statements? Surely they would not post anything that is not official, in the interests of donors? And here we see that indeed the NTDM China page is actively involved with the main NTDM page. Once again we state that we are simply making observational comments for the purpose of transparency and trying to ensure that Mrs Yang does indeed receive ALL the funds raised in her name to be used for her as per the requirements of a restricted fundraiser.